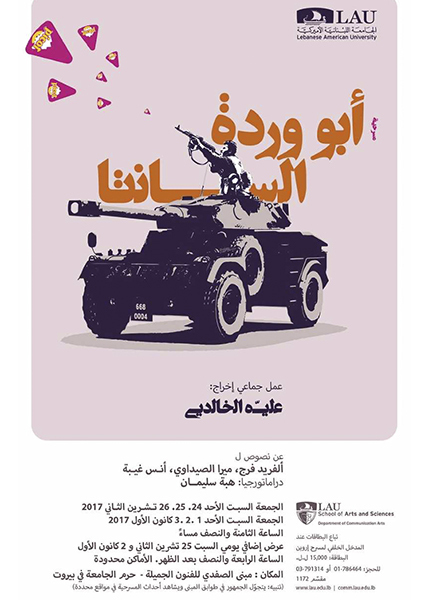 In this play, the audience immerses itself in a journey undertaken by four characters: a war photographer, a female singer, a female bookshop owner and a university professor who is also a party member. The aim is to try to recover their memories. The Lebanese civil war, naturally or else deliberately forgotten, has today, and more than ever before, assumed a sectarian and majority/minority aspect. Alfred Faraj frames it thus: “Lebanon today is just a small example, a laboratory or a practical experience of what may well happen in the region between the Atlantic Ocean and the Arabian Gulf.” A loss of memory is therefore another aspect of the loss of humanity. Remark: This is a walk-through performance where the audience will tour the floors of the building and watch the scenes in different locations. An additional performance will take place on Saturday, Nov. 25 at 4:30 p.m. It will also be performed from Dec. 1 to Dec. 3 at 8:30 p.m. with one additional show on Saturday, Dec. 2 at 4:30 p.m.
Tickets at L.L. 15,000 available at the back entrance of Irwin Theatre Tel: 01-78 64 64 / 03-79 13 14 ext.1172. Places are limited.